Back in New York, no one quite believed my accounts of urban renewal across the Midwest, through a piece of the Rustbelt, and then back — that St. Louis is the Brooklyn of the heartland, or that even downtown Buffalo has charms. I tended to be on safer ground when I described Targeted small towns in Ohio, or drive-by shootings in Chicago. Despite the skepticism I knew I would eventually encounter, my idea was to go intercity with mass transit and to get around locally with my bike. I found that the downtown areas of many Midwestern cities are vibrant, rust free, and often ideal for biking, as well as for hotels, trendy restaurants, and funky businesses. It’s on the periphery of these Potemkin-convention cities that the bright lights dim on the porches of ramshackle wooden frame houses. That's where the new ghettos look less like rundown public housing and more like rural shanties that have washed up in earlier working-class suburbs. Does it work to travel from Chicago to New York with a folding bike on trains and buses? Give or take, I managed fine. Amtrak grudgingly accepts folding bikes as normal luggage (it is easier to take a gun on board Amtrak than a full-sized bike), and intercity bus drivers (many are cheerful souls) are indifferent about baggage stowed below. The bigger problem in my planning was that few trains other than freights cut across the heartland from St. Louis to Cleveland. While buses do make the connections — say, from Terre Haute to Bloomington, Indiana — many of my departures took place between 5 and 6 a.m., the time that a friend calls o’dark. Nor were the intermodal connections seamless. Routinely, I was dumped off the bus at a Hardee’s in Nowheresville. Between Quincy, Illinois, and Hannibal, Missouri, the only place open at lunchtime was an adult superstore, but I hadn’t worked up an appetite for lace underwear. Chicago: I went all over Chicago on the bike, from Frank Lloyd Wright’s show-homes in Oak Park to the South Side slums (where that weekend twelve people were wounded in assorted shootings). I also made it to the old stockyards, Haymarket Square (of anarchist fame), and the Hyde Park home of President Barack Obama, which now is unpleasantly hidden away behind tall trees, concrete anti-terror barriers, and snarling guards, giving it the air of a Beirut embassy. Beyond the elegant Loop, lakefront, university districts, and various solid neighborhoods, Chicago has endless stretches of abandoned warehouses—no man’s lands between the city and suburbs, belts in search of manufacturing. St. Louis: Few city downtowns are as pleasant as that of St. Louis, which struck me as having a perfect mix of parks, restaurants, stadiums, hotels, and office buildings converted into residential lofts, many with views of the Mississippi and the Gateway Arch. I biked out as far as Clayton, Missouri, through the incomparable Forest Park, and looped around several universities, hospitals, and museums, all of which add to the city’s infrastructure luster. Most of what I saw was white St. Louis, as gracious as a southern plantation, although coming and going I went through northern and eastern satellite suburbs — Ferguson is one of many — where the local economy seems to revolve around selling tires, check cashing, and all-night convenience stores. Indianapolis: On the way from St. Louis to Indianapolis, I stopped in Springfield (part of a Lincoln haj) and Terre Haute. My bus into the Indiana capital left me at the “downtown transit center,” a dreary cave of broken vending machines, now that the former railroad station is an elegant hotel. The rest of downtown Indianapolis sparkled, and I spent the best day of my travels ducking into the Eiteljorg Museum of American Indians and Western Art, drinking coffee on sunny terraces, following bike paths, exploring the canals, and touring the city’s many universities, Butler and Indiana-Purdue among them. Canton: So poorly is Ohio served with public transportation that I was forced to rent a car to go from Dayton Trotwood (a sad shopping center where the Indianapolis bus dropped me) to Canton and Cleveland. I stuck mainly to the secondary roads, often clogged with traffic and slow lights. Unless someone can add a dome, Astroturf, and The Gap to Hometown USA, it will be lost. Canton was the saddest city on my travels. Not even the presence of the Pro Football Hall of Fame or William McKinleyism can put a positive spin on the vacant lots and boarded-up storefronts. 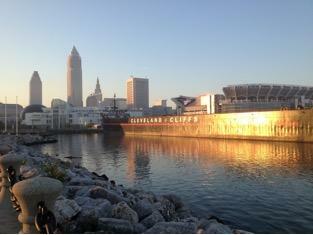 Cleveland: I was back on the bike, and loved much of what I saw downtown in the canyons of Art Deco office buildings. Cleveland is more of an extended suburb than a city — if not a state of mind with a football team — although it can quickly change from blocks of lakefront mansions to rows of seedy body shops… emphasis here on the word “body”. The new ghetto arose from the old working class neighborhoods; a nether world in the shadows of subsidized convention centers and urban renewal towers. Buffalo at night is a ghost town, although I loved riding north along Delaware Avenue to the state university. In upstate New York, I made a loop around the Finger Lakes through such rustbelt stalwarts as Corning, Binghamton, Syracuse, and Auburn. The delight was Elmira, with its local college that has the Mark Twain writing studio in which he wrote Tom Sawyer and Huckleberry Finn. Ithaca is a labyrinth of universities and dead-end streets that gets my vote for the most confusing city grid in America. Syracuse at night — on the bike or waiting at the bus station — felt like the set of a sci-fi movie in which everyone has been vaporized. Binghamton aspires to hipness, but, well, it’s Binghamton. At least Auburn has the prison, and at midnight its strange aurora borealis of klieg lights made my bike vest glow like medieval chain-mail. A series of buses and commuter trains took me down to New York City. I had booked on Amtrak, but its Lake Shore Limited was routinely seven or more hours late. One conductor blamed the delays on the weather from the previous winter, although my seat mate said impoverished locals robbed the copper from the track signals. At the end of my riding, I think I came across as someone as morose as the novelist Theodore Dreiser, who took what he called “a Hoosier holiday,” at a time when, as he wrote, “America was in the furnace stage of its existence.” But I defy anyone who doesn’t take heart from a Lake Erie sunrise.